Fannie Lou Hamer, the youngest of twenty children, was born in Montgomery County, Mississippi, on 6th October, 1936. A sharecropper, Hamer did not know that African Americans could vote until she attended a a Student Nonviolent Coordinating Committee (SNCC) meeting at a church in Ruleville. When Hamer attempted to register to vote, she was arrested and jailed. The next day her landlord told her that if she did not withdraw her request to vote, she would be forced off her land. Hamer responded by becoming an active member of the SNCC. After losing her work on the plantation, Hamer was employed as a field secretary of the SNCC and in 1963 she was instrumental in establishing the Delta Ministry, an extensive community development program. During the Freedom Summer campaign she helped form the Mississippi Freedom Democratic Party. Hamer became a national figure when at the Democratic Party national convention she made a passionate speech challenging the seating of the regular all-white Mississippi delegation. In 1968 Hamer founded the Freedom Farms Corporation (FFC) a non-profit venture designed to help poor farming families. It also provided social services and grants for education. 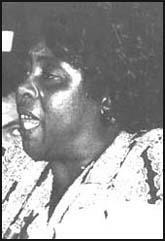 Fannie Lou Hamer died in Mound Bayou, Mississippi on 14th March 1977. I've worked on voter registration here ever since I went to that first mass meeting. In 1964 we registered 63,000 black people from Mississippi into the Freedom Democratic Party. We formed our own party because the whites wouldn't even let us register. We decided to challenge the white Mississippi Democratic Party at the National Convention. We followed all the laws that the white people themselves made. We tried to attend the precinct meetings and they locked the doors on us or moved the meetings and that's against the laws they made for their ownselves. So we were the ones that held the real precinct meetings. At all these meetings across the state we elected our representatives to go to the National Democratic Convention in Atlantic City. But we learned the hard way that even though we had all the law and all the righteousness on our side - that white man is not going to give up his power to us.